La Petite Robe di Chiara Boni cocktail dress in stretch jersey. Features a stained glass, kaleidoscope print. 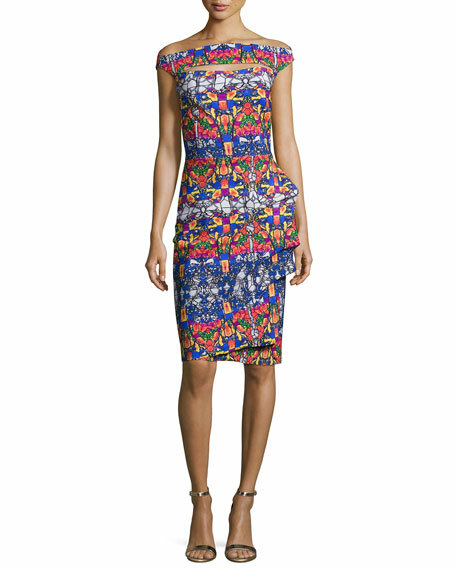 Alice + Olivia "Harmie" cocktail dress in stretch lam??. Approx. 33.5"L from shoulder to hem. Draped square neckline. Spaghetti straps. 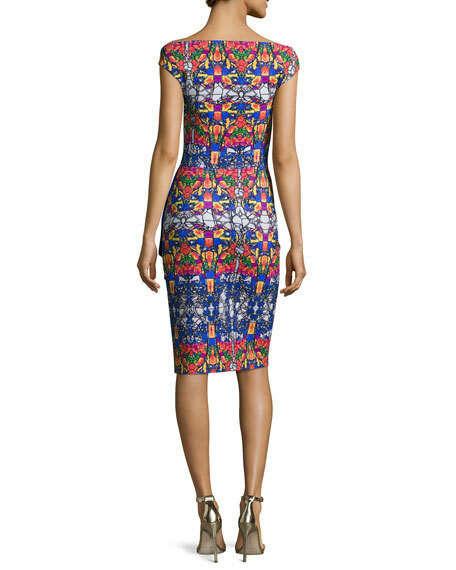 Alice + Olivia "Harmie" cocktail dress in stretch lam??. Approx. 33.5"L from shoulder to hem. Draped square neckline. Spaghetti straps. Bodycon silhouette. Mini length. Exposed back zip. Polyester/spandex, Nylon/spandex lining. Imported. Badgley Mischka Collection cocktail dress in allover sequins. Off-the-shoulder neckline with velvet trim. Long sleeves. Hidden back zip. Sheath silhouette. Badgley Mischka Collection cocktail dress in allover sequins. Off-the-shoulder neckline with velvet trim. Long sleeves. Hidden back zip. Sheath silhouette. Knee-length hem. Self: polyester. Combo: polyester/spandex. Imported. Model's measurements: Height 5'9" / 175cm, bust 32"/81cm, waist 23"/58cm, hips 35"/89cm, dress size US 2. Brunello Cucinelli cocktail dress in wool jersey with wide, paillette knit overlay. Approx. 42.5"L down center back. Off-the-shoulder neckline. Cold shoulders; thin straps. Long, blouson sleeves. Sheath silhouette. Mid-calf length. Virgin wool/spandex. Made in Italy.